It has been eight years since Metallica released Death Magnetic, an album that was heavily criticised for its lack lustre production, lack of dynamic range and once again, Lar’s drum sound. 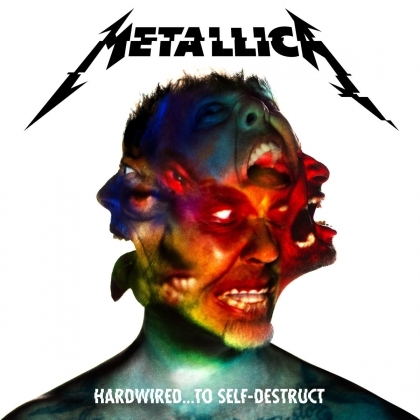 Opening track “Hardwired” was the first single to be released and sounds very much like Metallica are trying to get back to basics, fast kick bass drumming, shouted vocals and good old thrash riffs a plenty, and in most parts they do succeed. “Atlas, Rise!” continues the thrash onslaught with Kirk Hammett’s solo really bringing the track alive. “Now That We’re Dead” slows things a little, and is placed on the track list far too early as it brings the whole momentum to a crashing stop. More thrash is what was needed here. However things pick up with the doomy “Dream No More”, a bit of a slow-burning track this, with a NWBHM sound. The final track on cd1 is the grandeurs epic “Halo on Fire”, neither completely head down thrash nor speed metal, it walks a fine line blending the two. This is classic Metallica, the way Kirk weaves his magic makes this THE track on cd1. CD2 kicks off with “Confusion” – a mid-tempo rocker full of great riffs and once again, monster work from Kirk. The track was written from the perspective of a soldier with PTSD, much in the same vein as “One” was written about a solider returning from the horrors of world war one. Mightily impressive. “ManUNkind” gives Rob Trujillo’s bass an airing, before the track loses any sense of direction for me, if it’s as if the song has been over thought, with weird time changes, this is certainly the albums weakest track. “Here Comes Revenge” is a song that has a bit of “Enter Sandman” feel about it, but is not in the same league, yes there is a blistering guitar solo and a great chorus, but the verses feel as though they have been added as an afterthought, though it did grow on me after a few listens. “Am I Savage?” is a slow paced doom track that Metallica can do really well, songs like “Sad, But True” or “The Thing That Should Not Be” takes you on a journey. “Am I Savage?” follows this same line with some great riffage from James followed by some wonderful playing from Kirk to really help to lift this track. “Murder One” is a great tribute to the late, great, Lemmy. lemmy/Motorhead were very influential on Metallica in the early years and they wanted to honour him, so what better than to use a bunch of Lemmy’s song titles and lyrics in a Metallica track. However I would have liked this to be a straight sounding Motorhead track, full of Rob’s rumbling bass lines. It does border on cheese, though the video for this track is superb. The album closes with the best song on the second disc, “Spit Out The Bone”. This is fierce and brutal, there is thunderous drumming from Lars, and probably his best playing on the entire album, yet for all the aggression, it is precise and melodic. Rob pops up to deliver a quality distorted bass rumble worthy of Lemmy himself. Clocking in at nearly 78 minutes this is a massive release for Metallica, not just for the fans, but to prove to everybody that they still have it. There are a couple of dodgy tracks on here, but there is enough variety to please most fans, and that can only be a good thing. I can’t fault Metallica here though. They have delivered a knock out album.